The Media, Communication and Cultural Studies Association present Lisette Johnston with the 'Journalism Research Prize' at their annual conference. Lisette Johnston, a second year PhD student at City, saw off competition from more established academics to win the 'Journalism Research Prize' at the Media, Communication and Cultural Studies Association's (MeCCSA) annual conference, last week. Lisette's paper, entitled 'User Generated Content (UGC) in the newsroom: How BBC journalists' engagement with internet activists has altered newsroom practices' examines the way in which UGC has allowed BBC newsrooms to understand and engage with developments surrounding the conflict in Syria. 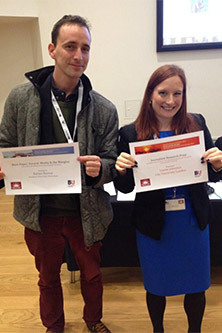 Lisestte (right) is pictured with Balázs Boross winner of the Best Paper Award for Media and the Margins. Professor Suzanne Franks, Director of City's Journalism undergraduate course, was a keynote speaker at the event. She is also Lisette's PhD supervisor and said: "This is a terrific achievement at such a very early stage in an academic career. There were a huge number of good papers presented at the conference so Lisette deserves to be proud of winning against such a competitive field of experienced academics. It augurs well for her career." Lisette's other PhD supervisor, Dr Neil Thurman, said: "Lisette's privileged position as a journalist is giving her rare access into how the conflict reporting of one of the world's largest news organisations - the BBC - is changing in response to content from citizens and activists on the ground. This award is in recognition of Lisette's initial work and I'm sure her research will win even more acclaim as it progresses". MeCCSA's prestigious annual event which brings together academics teaching media, communication and cultural studies at higher education institutions in the UK. The theme of the MeCCSA 2014 conference, which was held at the University of Bournemouth, was 'media and the margins', the engagement of marginalised and minority groups with the media. Examining power relationships amongst groups in society has long been a preoccupation of media and cultural studies, and the conference built upon this body of work.